Albright University. 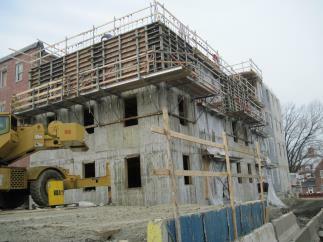 This project is a 4 story addition built entirely out of structural concrete (no steel frame support). It features 16,500 sq. ft. of walls and 45,100 sq. 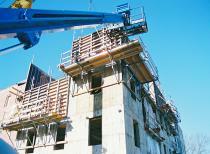 ft. of slabs, giving it a total of over 2,200+ cubic yards of cast-in-place concrete! 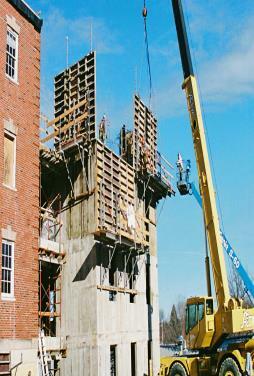 For the walls we used a crane-lifted gang form system, and for the floors we used underslab shoring towers with a plywood top. 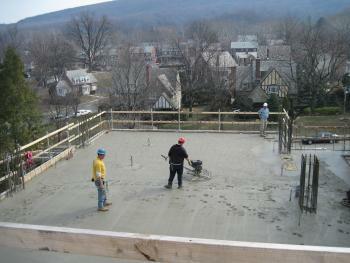 Finishing a slab on deck. Above and below: A few examples of the gang form system we used to pour the walls.